Via taz gazete – An article reporting about the situation of Syrians in Izmir and growing racist tensions and attacks. Available in Turkish and German. Foto: Sevda Aydın. Suriye’deki iç savaşın hemen başlarında en çok göç alan bölgelerden biri Basmane’ydi. Büyük İskender, gördüğü bir rüyanın ardından insanların eskisinden dört kat mutlu yaşayacağını düşünerek Kadifekale’ye bir kent kurmaya karar verir. Kadifekale’de şimdilerde eskisinden dört kat daha mutsuz mülteciler yaşıyor. In İzmir leben 140.000 Syrer*innen. Viele Einheimische sehen sie als Gäste, die irgendwann wieder zurückkehren sollen – manche greifen die Geflüchteten an. Birgün introduces the striking data on the migrant labour in Turkey as indicated by the report prepared by the Republican People’s Party (CHP) titled “Migrant Labour in our Country”. Via Birgün – According to the “Migrant Labour in Our Country” report prepared by CHP (Republican People’s party) Labour Bureau, the majority of migrants, with Syrians at the first place, work irregularly, under heavy exploitative conditions, and dozens of them loose their lives in workplace homicides. Turkey is home to more displaced Syrians than any other country, but growing intercommunal violence between refugees and their hosts is straining relations. Sanliurfa, a city of 830,000 people in southeast Turkey, is the latest to be rocked by unrest between Syrians and Turks. On September 27th, two Turkish youths were killed by Syrians following an argument between neighbouring families. In the days that followed, angry mobs of locals attacked Syrians and their businesses, confining many to their homes for much of the past week. This week, the Journal of Refugee Studies published a new paper by Deniz Pelek on Syrian refugees working in the agricultural sector in Turkey. Abstract: This article examines the case of Syrian refugees as seasonal migrant workers in Turkey and critically discusses the working and living conditions fostering their relative vulnerability compared to other workers. Syrian refugees are subject to discriminatory practices in terms of lower wages, longer working hours and improper sheltering conditions. This article explores how unequal power relations between ethnically different groups of workers in the agricultural sector are (re)constructed and the consequences of the emergence of Syrian refugees as a novel class. The essential aim of this study is to unravel the process and practice of ethnically hierarchized agricultural labour market after the entrance of refugees. The Turkish city of Erzurum sits on an expansive green plain, ringed on all sides by towering mountains. Best known as a destination for winter sports enthusiasts, who flock here when snow blankets the nearby slopes, it is also a gateway for another set of visitors – Afghans uprooted by their country’s long and brutal war. Located about 240 kilometres from the Iranian border, Erzurum is one of the main transportation hubs between Turkey’s far eastern regions and the rest of the country. 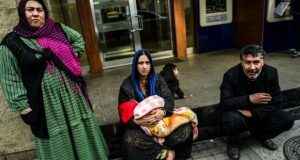 Before a recent crackdown, its parks, mosques, and bus station overflowed as people slept rough before continuing on to Ankara, Istanbul, or towards the border with Europe. According to the report of Building Markets, the number of Syrian companies in Turkey is above 10 thousand. According to the report Turkish Economics and Politics Research Foundation (TEPAV) prepared, based on the data drawn from The Union of Chambers and Commodity Exchanges of Turkey (TOBB), 6,589 company was founded with Syrian capital between 2010-2017. 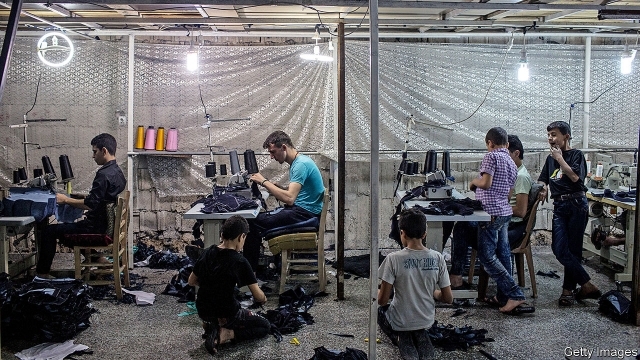 The number of Syrians employed in these small and medium-scale Syrian companies are estimated to be around 100,000. Syrians under “temporary protection” in Turkey are not exempt from work permit. In order to hire a Syrian, the employer should apply to work permit through the Ministry of Labour, Family and Social Services, and the companies are obliged to limit the number of Syrians with 10% of the all employees.